FlexHEX maintains an unlimited Undo list. While the customary Edit / Undo and Edit / Redo commands work exactly as expected, the Undo List command is worth a more detailed mention. The list contains all the changes since the last save. In order to undo or redo just click the desired action (or move the selection bar with the Up and Down arrows and press Enter). The action selected is the last active action; all the actions below, that are shown in grey, have been undone. FlexHEX removes the changes from the Undo list after they are committed. This means that the Undo list is cleared when the file is saved. Although in most cases this is not critical, this potentially might cause a problem if you are making intermediary save while the BAK file option is turned off. 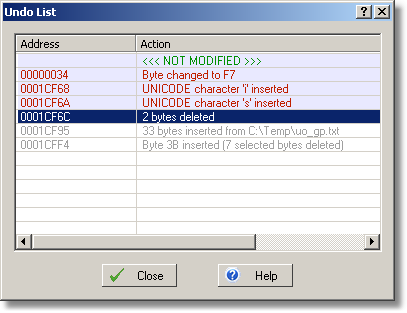 FlexHEX maintains independent Undo lists for each stream in a multi-stream file. This is due to the fact that the streams are in fact independent files using the same name and attributes. In order to return the file to the unmodified state you should undo changes in all the streams. Changing a file from sparse to non-sparse or vise versa changes the file state to MODIFIED in the status bar, but does not add a record to the Undo list. The reason is there is nothing to be undone – the sparseness attribute just instructs the system how it should store the file, and does not change the file itself. Simply change the sparseness attribute back, and the file will return to the unmodified state. Unlike files, drives can't have alternate streams. Additional items in the Stream Pane, like FAT or partitions, are not actually streams but rather views of the main and only stream. Drives has the only undo list which belongs to the main stream. As a result the addresses in the Undo List window are the main stream ones, and any undo list operation switches the view to the main stream.